Today’s Tuesday Tip was written by Matthew “Rowan” McDonnell and is brought to you by the American Ultimate Academy, the world’s first ultimate-specific training academy, and, as always, presented by Spin Ultimate. All opinions are those of the author. Offensive players have it easy in ultimate. They get to pick where to go and when to go. I’m here to challenge that notion. It’s time that defense takes back the power. Defenders should dictate the area of the field that cutters attack, not vice versa. Today, we are going to go over several techniques defenders can use to control where and how cutters attack. ‘Dictating’ is a great word for defenders to learn. As defenders, we always want to try to determine where the offense goes. There are two primary ways we can dictate. Physically, we can use our body to take away the line a cutter wants to attack. And spatially, we can use angles to discourage a cutter from going to certain areas of the filed. Before we cover both topics, let’s incorporate a skill that will help both. Dictating would be a lot easier if every play in ultimate started on a dead disc. Instead, you have players in constant motion, the disc moving all over the field, and the angles of attack always changing. That’s why we have to orbit: to constantly adjust your body positioning to get into the optimal space from which to dictate. Let’s work through a couple scenarios to better grasp this concept. Imagine you’re guarding a player second from the back in a vertical stack. The handler with the disc is on the open side. The cutter in the back makes a great cut and gets a 15 yard under. What should you do? Well since the stack is now behind or even with the disc, your cutter does not want to come under for a five yard pass: they want to use their shallow depth to attack deep. Here you can get a body on their deep line to discourage that cut, or spatially make your triangle with a huge buffer to discourage the away and make them take that small under. On the other hand, if the first cutter does not get the disc, clears back to the stack, and the disc is dumped towards the backfield, your cutter is up next, but way too far down the field for a good deep cut. Here might be a great time to orbit underneath and dictate the away, because an under here would be for a big gain, especially since a huck to a cutter who is starting too deep often results in a turnover. We can also reposition when the disc moves laterally across the field. If we are playing spatial defense, we can adjust the size of the triangle depending on where the disc is in relation to our cutter. If we are defending a cutter in the middle of the field, we have to be honest if the disc is also in the center third. When the disc gets closer to the force sideline, we can move off laterally closer to the disc, knowing the cutter has to close some of the space to attack. When the disc swings to the break side, you might want to put your body on the break side, especially early in the stall count when the mark hasn’t sealed the break continuation yet. To play good physical defense, you want to use your body as a barrier to stop a cutter from going to the area they want to attack. The open side under is the most commonly attempted (and completed) downfield pass, making it critical that we work to stop it. To dictate the cutter out of this area, bring your body underneath the player, and make sure you are shaded slightly to the open side. From this position, when the cutter still tries to win the under, we can use our body to make them adjust their angle and acceleration. A cutter still trying to beat you under with your body in the way has two choices. The first option is to take the open side. However, your body will force them to take a wide angle, which gives you more time to close in for a block when the disc goes up. Or, if we roll with the cutter and maintain close proximity, the cut will be looked off by the thrower, and you have done your job as a defender. In the GIF below, you’ll see how to roll to successfully come out of the cut shoulder to shoulder. If the cutter decides to instead attack us on the inside, we need to have our body in the way so they don’t have a free line to the under. We can still roll with the cutter, but this time we are rotating the other way. Since we are now on the open side, it is a difficult throw for the thrower, and they will need to throw the disc to the inside shoulder. If the disc comes out wide even by a few degrees, we are in great position to get a block. Giving up the inside, which might seem like a win since you have correctly stayed on the open side of the cutter, requires a 180 degree hip turn, slowing you down much more than a 90 degree funnel to the outside. Therefore, it is urgent that your body is in the way so the cutter slows down and cannot get separation out of their break. In the next clip, you will see the defender maintain the open side but give little resistance to the cutter. While it may seem correct since we have stayed on the open side, it is poor defense. We can also use our body to stop away cuts. Keep in mind that, on deep cuts, disparities in speed and quickness are more apparent, since the cuts can be 40, 50, or 60 yard races, whereas an underneath cut is only a 10 or 20 yard race. As a result, it is extremely important that we get our body in the path of a deep cut before it even begins. Most hucks are thrown in rhythm, early in the stall count. If we can get our body in the way of a deep cut early on, then the separation will not have developed until the thrower has moved through their progression to a different receiver or dump. It is impossible to completely stop a deep cut with our body, but if we disrupt it at the right time, it effectively cuts it off or encourages the cutter to take the under. Physical Defense Pros: Disrupt timing, slow down acceleration, offense feels your pressure. If your skill set is your quickness and speed, or you don’t feel comfortable playing physical defense, then it’s time to use position and angles to dictate the cutter where to go. The first step to dictating spatially is to set up a triangle with you, the thrower, and your cutter. With eyes to the action, this defense lets you see more information about what is happening on the field. We can use the depth of our triangle to dictate certain cuts from the offense. By lining up three to four yards behind our cutter, we are discouraging them from going deep, whereas if we line up fairly even with the cutter, we are in a great position to deny the under and force an away cut. If we are actively stopping the open side under, we are going to make our triangle much more shallow. Since we are level with our player but shaded to the open side, we have a head start on a pass thrown to the under. 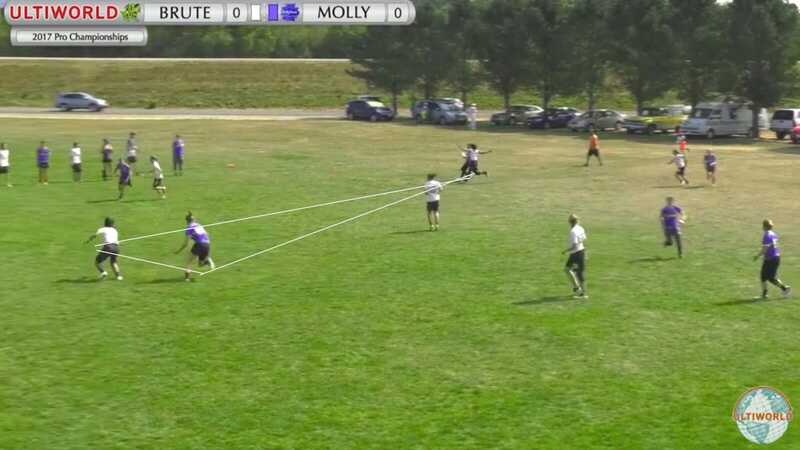 Take a look at this screenshot, and notice how Molly Brown’s Jesse Shofner (purple) is not just even but slightly underneath her cutter. Jesse has decided that she is not going to give up the under. If you don’t have help deep, or you are guarding a dangerous deep cutter, then you should bring your body three to four yards over the top of your cutter. This will discourage a lot of deep cuts from materializing. If the cutter still decides to attack you, make sure you keep a buffer behind them. If not, they will cause you to turn your hips, and when that happens, smart cutters change direction and get an easy under for a big yardage gain. If you want to play this type of defense, work on a ‘bail’ step, where you are running sideways with your cutter, which prevents you from ever completely committing your hips in on direction. Since you are staying several yards deep of your cutter, you should be able to keep them in your peripheral vision the entire time. Spatial Defense Pros: Get more information from the field, can communicate with team. Utilize speed and quickness to generate blocks. Efficient vs. bigger or stronger cutters. Spatial Defense Cons: Susceptible to double moves, or if you get someone in your blind spot. Cutter has room to accelerate and no physical resistance. In conclusion, downfield defense starts with thinking consciously and not just reacting to what the cutter throws at you. If you’re new to the game, you might not be able to hold so many things in your head, such as the wind, the skill of the thrower, your coaching schemes, where the disc is, etc. But with experience, you can work on building up the mental processing skills so you can consistently orbit to the best position to dictate your cutter. Remember, dictating is about making the cutter go where you want. Good defenders can generally protect either the deep or the under. Great defenders can take one option entirely away and still pressure the other. The American Ultimate Academy provides camps, clinics, videos, and other instructional material to help players of any skill to find ultimate success. Did you know AUA’s YouTube has over 40 free ultimate tutorials with over 250,000 views? Check out their Month of Ultimate videos and follow them on Facebook! 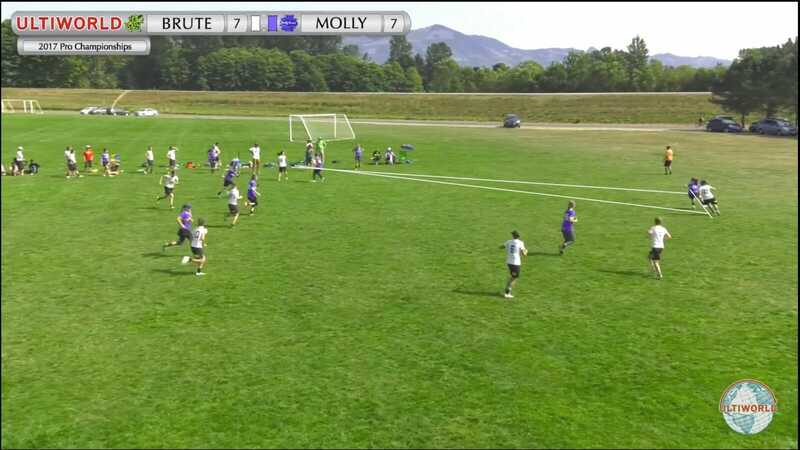 Comments on "Tuesday Tips: Playing Great Downfield Defense, Presented By Spin Ultimate"